Blessed John of Parma (1209-1289) was born at Parma. He studied and taught philosophy and known to be a devoted man to the Lord. Sensing the Lord’s call to serve Him more intensely, John entered the newly founded Friars Minor, the group that followed Saint Francis of Assisi. Completing his theological studies John was ordained priest and taught theology at Bologna, Naples and eventually in Rome. Father John was sent to the Council of Lyons in 1245. In 1247, Father John was elected the 7th minister general of the Franciscans, an election presided over by Pope Innocent IV, who thought very highly of Father John. John set in motion several initiatives to keep the friars focussed on the mission of Francis and his spirit looking keenly on poverty and humility as hallmarks of the Franciscan way of living the Gospel. Father John was sent as a papal legate to Constantinople in an attempt healed the schism between Catholics and the Greek Orthodox. He had limited success. Our peripatetic friar died on March 19, 1289 and his feast is kept on March 20. 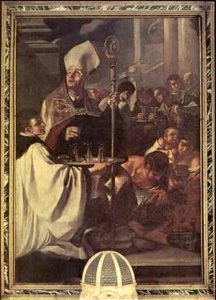 Father John was beatified in 1777. More on Blessed John of Parma can be read here. Saint Colette is the famous 15th century reformer of the Poor Clare nuns. You see her reform noted as the Colettine Poor Clares. She follows to a “T” the rigorous life set down by Saint Clare herself in hearing the words “If any want to become my followers, let them deny themselves and take up their cross and follow me.” She did; so did others. Lord, may the gifts we bring You help us to follow the example of Saint Colette. Cleanse us from our earthly way of life, and teach us to live the new life of Your kingdom. Here the Church wants us to receive the gift of singular focus on the new we’ve received already through Baptism, Confirmation and the Holy Eucharist. The new life preached by Christ and the Church today. 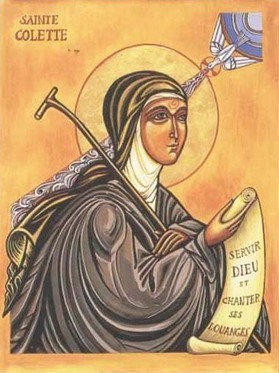 According to the Roman-Franciscan Sacramentary of 1974, February 7 is the liturgical memorial of Saint Colette, not March 6 as noted in other places. A previous blog post on Saint Colette can be read here. Our catechesis today deals with Saint Catherine of Genoa, a fifteenth-century saint best known for her vision of purgatory. Married at an early age, some ten years later Catherine had a powerful experience of conversion; Jesus, carrying his cross, appeared to her, revealing both her own sinfulness and God’s immense love. A woman of great humility, she combined constant prayer and mystical union with a life of charitable service to those in need, above all in her work as the director of the largest hospital in Genoa. 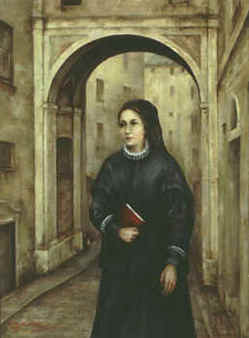 Catherine’s writings on purgatory contain no specific revelations, but convey her understanding of purgatory as an interior fire purifying the soul in preparation for full communion with God. Conscious of God’s infinite love and justice, the soul is pained by its inadequate response, even as the divine love purifies it from the remnants of sin. To describe this purifying power of God’s love, Catherine uses the image of a golden chain which draws the soul to abandon itself to the divine will. By her life and teaching, Saint Catherine of Genoa reminds us of the importance of prayer for the faithful departed, and invites us to devote ourselves more fully to prayer and to works of practical charity. 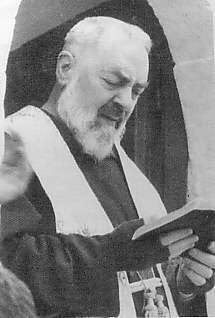 Finigan, posted a YouTube video clip of Saint Pio of Pietrelcina showing some rare footage. It is a very delightful video of the saint with his Capuchin brothers. Padre Pio is a favorite saint who died in 1968; watching him brings to life a new experience. of his brothers dealing with the massive postbag which he generated.” Finigan also notes the footage of Saint Pio celebrating the Mass. One thing I notice is that the Capuchin priests all cover their hoods when vested for Mass -as they are supposed to do. Too often covering the hood with an amice is not done not only by Franciscans but the Dominicans; the acolyte serves the Mass with a surplice and hood uncovered. A piece of liturgical observance. Father, You helped Elizabeth of Hungary to recognize and honor Christ in the poor of this world. Let her prayers help us to serve our brothers and sisters in time of trouble and need. Saint Elizabeth is the patroness of the Third Order Franciscans (the laity and secular priests). Her example of patience and holiness modeled on the good example of the Franciscan friars leads us to be attentive to the poor in our midst. Read the entire address Pope Benedict gave on Saint Elizabeth of Hungary on October 20, 2010.